Branch or not to branch that is the question? I've been asked a few times this week for a branch office router configuration, now I'm not a big fan of branch offices as I would rather have one big office because it's easier to support. Nevertheless I agree to show how this can be done, so branch office and the problems with them. 1) There is most likely no IT staff onside so they can be a pain for hardware configuration, if something breaks you have to send someone to fix it. 2) Staff at branch office offen are unregualted and therefor install anything they like, making them more likely to contract malware and virus, not to mention ilegal downloading. However there are ways around this. So lets get down to the basics before you can start you need to setup you security on the router, now I personaly like to use privilege levels to make sure only good admins have access however if your the only admin you might use just enable passwords. so these are your basic steps, so you should now have enable password and console password protection at least and TELNET/SSH password as well. Now we have a secure system we can start to add the configuration first is most likely to be DHCP service if you don't have a DHCP server in the branch office then you'll need to set this up. Now in our example we are going to have two VLAN's so will need to scopes also know as pools, another thing to note is the "import all" this takes Imports DHCP settings for DNS from your ISP (doesn't work for PPPoE) you might not want to do this and can use dns-server if you want to manually configure it and there are sometimes you might want to do this, but that is too much detail for this blog. Since we have WLAN on this example I'm also going to use a bridge interface so that both fastethernet ports and Dot11Radio0 can act as one on each VLAN, if you didn't have a WLAN then you could use the VLAN interfaces to assign the IP addresses too. 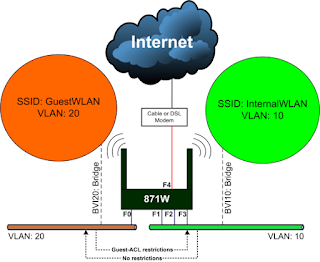 Now we need to create the bridge interface that will be used for access list and VLAN assignment. 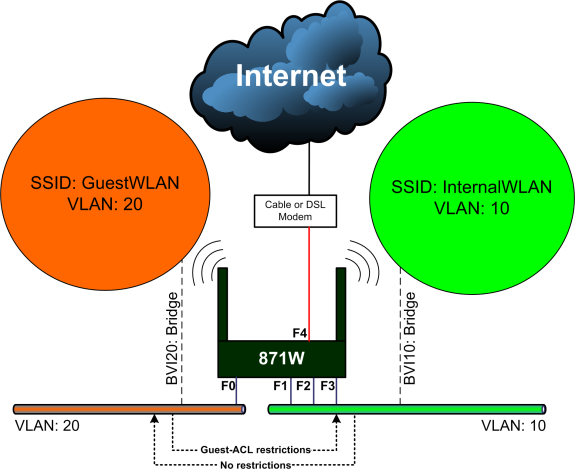 next we need to create the VLAN's and assign them to the bridge interfaces. And finally the ACL and firewall, but I won't go into deep detail as I've covered this is other postings. The above example would limit anything matched in ACL 102 (imaginary) to approx 2kbytes/second, that's a bit low I know but its an example normally I limit to around 512kbytes.